Having learned from previous historic wildfires, California utilities are updating their technological capabilities in hopes of making their networks more resilient and proactive when flames approach, representatives said at the inaugural 2019 Wildfire Technology Innovation Summit. With the start of the next wildfire season getting closer each day, California’s utility sector is racing to upgrade its technological capabilities. The goal: making power lines less likely to cause more disasters. Utilities are looking to artificial intelligence, expanding the use of fire-watching cameras, and improving their ability to monitor for extremely dry and windy weather conditions. They’re also trying to learn from the power companies and experts who are already ahead of the curve — but with climate change, it may not be enough to stem the fiery tide. Those were among the key themes that emerged as hundreds of utility representatives, academics, tech experts and others converged at California State University, Sacramento, on Wednesday and Thursday for the first wildfire technology summit convened by the California Public Utilities Commission. While the worst recent wildfires have been blamed on San Francisco’s Pacific Gas and Electric Co., some of the most prominent voices at the conference came from Southern California. San Diego Gas & Electric underwent a major push to enhance its technology and wildfire prevention efforts after a series of major wildfires in 2007, Caroline Winn, the utility’s chief operating officer, said in a speech Wednesday. The fires, she said, were a “game changer” for the company. It wasn’t easy to be the first California utility to take drastic steps such as intentionally turning off power lines when weather conditions threaten to spark wildfires, Winn said. Winn said her company plans to “strategically” bury more power lines underground in high-risk fire areas and use an algorithm that can detect a fault on a line and turn it off before it hits the ground. The utility also plans to use artificial intelligence to marshal “tens of millions of data points” that help it respond to risky fire conditions, she said. One of the steps the San Diego utility has taken in recent years is using a network of high-definition, pan-tilt-zoom cameras that watch for new fires and help first responders react appropriately when they occur. The camera program, which originated in the Lake Tahoe area, is now a critical tool in the response to wildland blazes around San Diego, said Graham Kent, the director of the University of Nevada, Reno’s Nevada Seismological Laboratory. Kent’s lab runs the camera program, called AlertWildfire, in partnership with other universities. After the devastating October 2017 wildfires that tore through Wine Country and other Northern California regions, North Bay officials followed San Diego’s lead and began building a fire network of their own. They started installing the cameras last year and now have a network of 16 in the greater North Bay area, some of which were funded by PG&E. PG&E, which filed for bankruptcy in January because of its looming liability from 2017 and 2018 wildfires, views the cameras as an important part of its fire prevention strategy in the future. The company intends to install 600 cameras throughout its 70,000-square-mile service area by 2022. A PG&E spokesman said the company will soon have 30 fire-watching cameras in the area it serves, which spans from Eureka to Bakersfield. PG&E is also planning to put about 1,300 new weather stations in place by 2022 and has 215 of them up and running now. 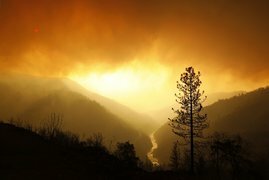 Sumeet Singh, the vice president in charge of PG&E’s community wildfire safety program, said on a panel Thursday that further technological advancements are needed as California utilities try to lessen the fire risk caused by their equipment in a changing climate. Singh said some of that work will require utilities to share more data with each other, a step they have historically been reluctant to take. He said the companies should look to the nuclear power sector, which he held up as a model for assessing risks in its equipment. Technological improvements are badly needed because California regulators are already doing everything they can think of to prevent power lines from starting fires, said Elizaveta Malashenko, deputy executive director of safety and enforcement policy for the utilities commission. Utilities nationwide are also employing more conventional means to make their equipment safer and more resilient. Florida Power & Light is spending $100 million over the next three years to put more of its power lines underground, according to Manuel Miranda, the utility’s senior vice president of power delivery. “We know it works during hurricanes, and I imagine it works really well here during the fires — or not causing fires,” Miranda said at the conference. At the same time, utilities must also develop more of an ability to “predict and get ahead of failures before they occur,” he said. Adding to the urgency is the fact that experts say climate change is expected to increase the severity of droughts and elongate California’s natural fire season even further, thereby worsening wildland infernos no matter what.